Cardinals manager Mike Matheny possesses excellent leadership skills, but needs to continue to show progress on his ability to make strategic decisions during games, his boss, general manager John Mozeliak, told Cardinals bloggers. Mozeliak and Cardinals president Bill DeWitt III were among those who addressed bloggers and answered their questions during the club’s 2014 Blogger Event on June 22 at Busch Stadium in St. Louis. In summary, Mozeliak said of Matheny, “There’s no one else we’d rather see” as Cardinals manager. DeWitt said expansion of Ballpark Village could include options such as a residential tower, office tower, hotel or retail complex. Taveras, the outfield phenom, was sent to Class AAA Memphis after a short stint with the Cardinals. Ron Watermon, Cardinals vice president of communications, said the franchise soon will debut a digital version of its media guide that will include a video of the Cardinal Way. He said the Cardinals will seek feedback from bloggers about the usefulness of the digital guide. ST. LOUIS — The Cardinals are spending millions of dollars on memorabilia in an effort to ensure their planned hall of fame and museum is first-rate. 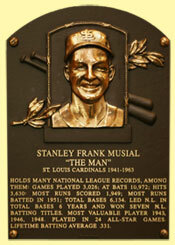 They also are getting a big assist from Stan Musial. Cardinals president Bill DeWitt III and team general manager John Mozeliak met with invited bloggers for 45 minutes on Sunday afternoon, April 28, 2013, as part of the club’s annual Blogger Event. Relaxed and talkative, DeWitt and Mozeliak answered every question asked of them in a lively and unrestricted question-and-answer session with bloggers in a Busch Stadium executive conference room. — Cardinals Nation. This will feature a Cardinals hall of fame and museum, bar, restaurant, store and party deck with a view into Busch Stadium, DeWitt said. In addition to including Cardinals already in the National Baseball Hall of Fame at Cooperstown, N.Y., the Cardinals Hall of Fame eventually will honor 50 to 70 other Cardinals, DeWitt said. He added the club still is working on the criteria for induction. — Brew Pub. This will showcase the international brands of Anheuser-Busch and may include a shuttle to the brewery for tours, DeWitt said. — Live Marketplace. This will include a music stage and will be a place for special events. It will be enclosed, with a retractable glass roof, DeWitt said. Asked whether the museum would include the St. Louis Browns uniform of midget Eddie Gaedel that belongs to DeWitt’s father, who was a Browns batboy and who now is the Cardinals’ owner, DeWitt explained that the uniform is at the National Baseball Hall of Fame but that “it would be fun” to see it displayed in the Cardinals’ museum for a while. I got a glimpse into the inner workings of the Cardinals organization and I was impressed by what I saw. The Cardinals hosted their invitation-only 2012 Blogger Event on Sunday, Sept. 9, at Busch Stadium in St. Louis. General manager John Mozeliak and team president Bill DeWitt III, son of the owner, met with select members of United Cardinal Bloggers in the Busch Stadium Conference Center, an elegant area ringed by glass-enclosed conference rooms that overlook the statues of Cardinals legends at the ballpark’s front entrance on Clark Avenue. Mozeliak and DeWitt appeared relaxed and approachable, seated before the bloggers about an hour before the Cardinals began their game against the Brewers. They treated the bloggers with respect and answered them with candor. Both of these progressive baseball executives opened their remarks by showing they understand how social media and credible bloggers benefit the Cardinals. Mozeliak reads the blogs. He said Cardinals bloggers generate “almost too much” information because there isn’t enough time in a day to read it all. “You truly have a passion for a topic we hold close to our hearts,” Mozeliak said. DeWitt said the Cardinals’ front office is seeking to become “an outreach organization at the social media level” and soon would develop ways to be more proactive in sending news and information direct to bloggers and through social media. He indicated more information from the front office may be geared for retweeting on Twitter rather than first being sent directly for mainstream media use. Mozeliak and DeWitt also answered questions from the bloggers. The questions were smart and thoughtful and so were the answers. — Mozeliak sees a bright future for the Cardinals because of a strong farm system that is stocked with talent. “We have a lot of depth. It is the strength of our organization,” he said. While some suggest the Cardinals should use the depth to make trades, Mozeliak sees it differently. “I look at those chips as assets (to be kept),” he said. That matches with an organizational philosophy to “focus on the long view” rather than the short view. — Mozeliak indicated the Cardinals work to prepare their minor leaguers for success because “St. Louis demands winning.” He cited outfielder Jon Jay and first baseman Allen Craig as examples of players whose success in the minors prepared them to handle well the pressures of performing for the Cardinals. A bonus to being able to interview Cardinals broadcaster and ex-pitcher Rick Horton at Cardinals Legends Camp Jan. 27 was the chance to watch a few innings of a game between former players and the campers at Roger Dean Stadium in Jupiter, Fla.
Because the public isn’t allowed to attend the games, there were only about five people in the stands — likely friends or relatives of the players. So the event took on a “Field of Dreams” aura as Hall of Fame players such as Lou Brock, Ozzie Smith and Bruce Sutter stepped onto the field in crisp, white Cardinals uniforms to play inside a ballpark so empty it might as well have been an Iowa cornfield. Sitting along the right-field line in the warm sunshine, I regrettably had only about 20 minutes to watch the action before having to return to my day job. Pitching for the Cardinals was Dave LaPoint, the left-hander nicknamed “Snacks” who was a member of the 1982 World Series champions’ starting rotation. Brian Jordan and Tom Lawless and Tom Pagnozzi were among those in the field. Sutter coached first base. And playing shortstop, wearing the familiar No. 1 and still looking to be in big-league shape, was The Wizard, Ozzie Smith. In the home half of the first inning, Smith, batting second, stepped into the left side of the batter’s box against a right-handed camper. The first couple of pitches missed the strike zone. Smith, giving the camper his money’s worth, swung at several subsequent pitches out of the strike zone, fouling off one offering after another until he got one to his liking. When the right pitch came, Smith uncoiled and launched a high fly ball into medium right field, near where I was sitting. The camper stationed in right looked into the sun and staggered, trying to follow the ball’s flight and gauge where it might land. He extended both arms, the glove on his left hand turned up, and prepared for the ball to fall. It landed halfway up one arm, near the edge of his shirtsleeve. With arms still stretched outward, he brought them together as the ball rolled toward his hands as if on a conveyor belt. For a moment, it appeared the ball might travel down his arms and into the glove. But then it slipped off his wrist and off his glove and toward the outfield grass. The fielder lurched forward, reached out with his bare right hand and snagged the ball, just as it was about to hit the ground. “Out!” was the umpire’s correct call. Ozzie Smith, who had circled first base and was headed to second, flashed a smile and headed back to the Cardinals’ third-base dugout, taking a good-natured razzing along the way from campers and Cardinals teammates. Witnessing that gave me a sense for the special vibes that come from Cardinals Legend Camp. The retired players clearly enjoy being together again and being on the ballfield. The camp, which was launched with significant help from broadcaster and former pitcher Al Hrabosky, is in its 12th year. Rick Horton has participated in 10 of the camps. Proceeds from the weeklong camp benefit Hire Heroes USA, a non-profit group that helps military veterans and their spouses find jobs after the completion of their service time. Asked about pitching in a camp game the day before, Horton described the feeling of being reconnected with former Cardinals teammates and the special bond they maintain. “Sometimes we wonder, ‘Whose fantasy is this, really?’ ” said Horton. “I fielded a ground ball back to me yesterday. I turn around and throw the ball to Ozzie Smith. He jumps straight up in the air, avoids the slide and throws on to first base for a double play. I got to tell you, it was a rush for me. “I know I’m getting out a dentist or a doctor or a lawyer, but just to be on the field with Ozzie again _ I really want to be a part of that. Playing is what gets us back to the relationships we were in 25 years ago. So that’s part of the magic of this.